Cooper Shelton chips the ball onto the green during the Quad meet at Albia this past Thursday afternoon. Shelton shot a 54 for Chariton and the Chargers placed fourth as a team at the meet. 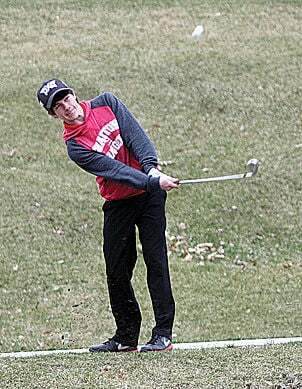 The Chariton boys golf team played in a Quad meet at Albia this past Thursday night against Albia, Clarke and Moravia. The Chargers placed fourth overall with a 222 score. Albia won the meet with a 189 score. Moravia was second with 194 and Clarke was third with 198. Clarke’s Conner Deutsch was the meet medalist with a 42. Clarke’s Taylor Henry was the runner-up with a 42. “This was our first meet of the year. We didn’t play particularly well. I thought we showed our inexperience at this meet. We have a few kids who haven’t played much golf, so it’s going to take them awhile. I think we will show a lot of improvement in our next meet,” Chariton Head Coach Ben Schooley said.